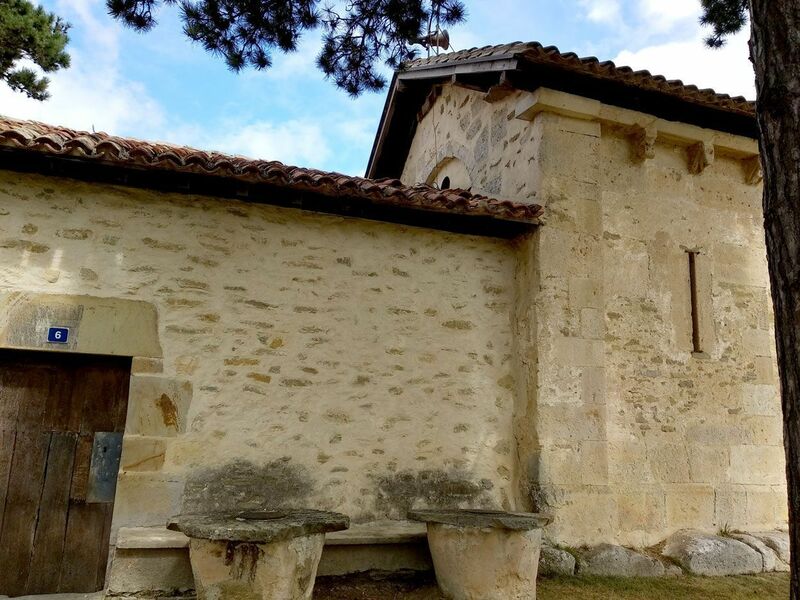 On the outskirts of the town of Elburgo, between crop fields, we find Saint John’s hermitage. 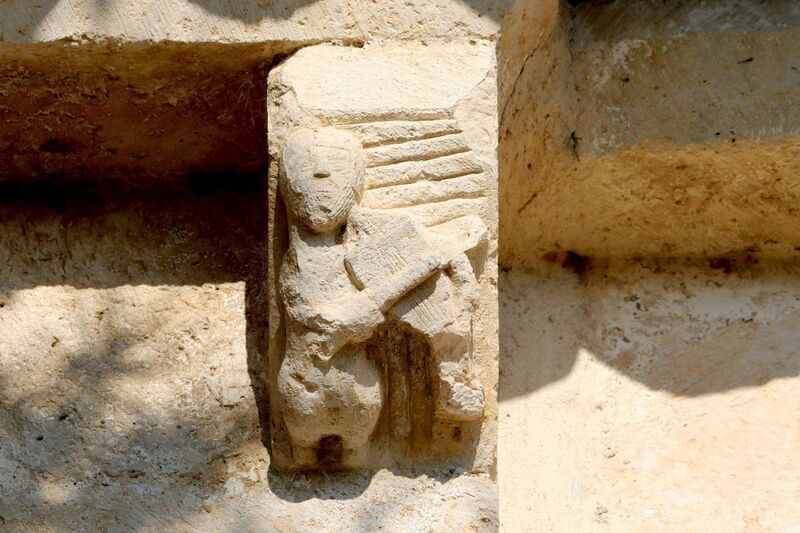 This building is the only standing remnant that testifies the existence of an ancient small village, named Arrarain, that prospered in the area until the 14th century, when it was abandoned. 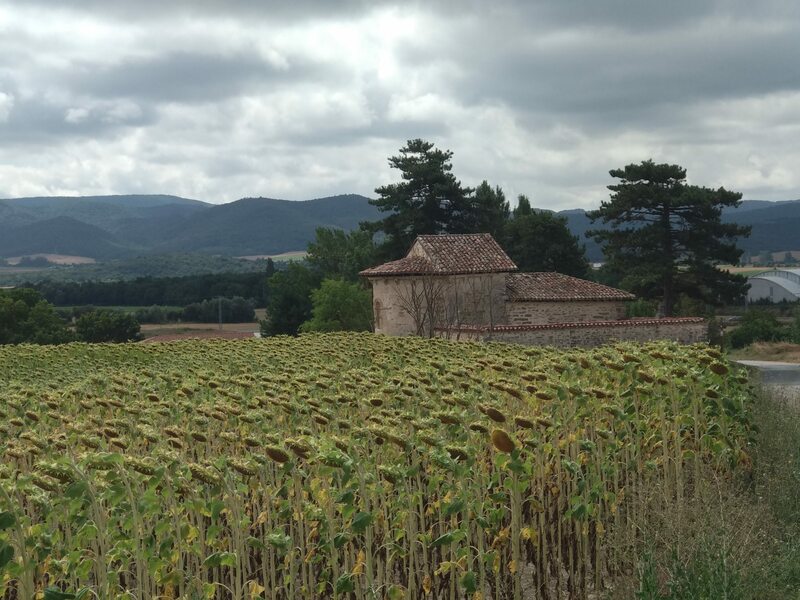 This abandoned village was located near the commonly known as “Road of the Romans”, which already indicates the presence in the vicinities of the ancient Roman road that connected Bordeaux with Astorga and that crossed alavaise lands. 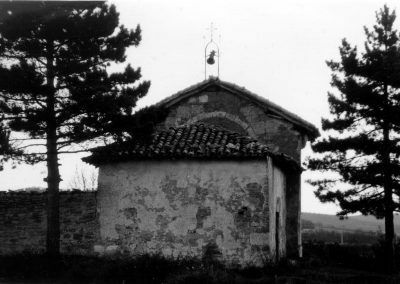 After centuries functioning as a hermitage, maintained by the residents of Elburgo, they decided to place their cemetery next to the north wall of the small temple, so this is why it works as the chapel of the town’s cemetery today. 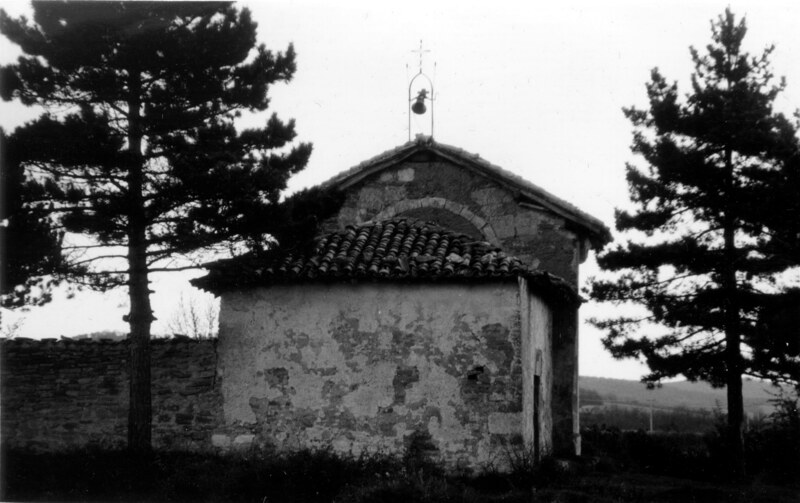 There are many abandoned villages or mortuorios (as they were called in the Middle Ages) in the Alavese Plains of which only the name has remained and, with any luck, the old parish converted into hermitage. The reasons for the abandonment of these places can be diverse: diseases that put an end to the lives of all the inhabitants, an uncomfortable location that causes residents to move to more comfortable areas, the abandonment of roads that used to attract trade or, as in the case of Arrarain, the creation of a nearby village that, due to its fiscal and legal advantages, contributed to the abandonment of the small village and to the move of the residents within the boundaries of the newly established town. 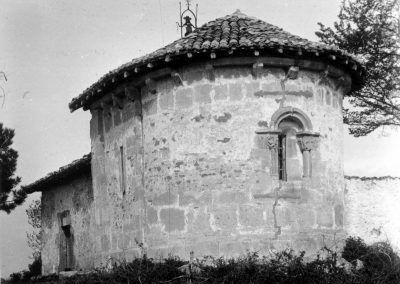 The foundation of Elburgo in 1337 by the Castilian king Alfonso XI entailed such a strong pressure for the adjacent villages that many of them were abandoned by their residents, who moved to the village in search of a better life. 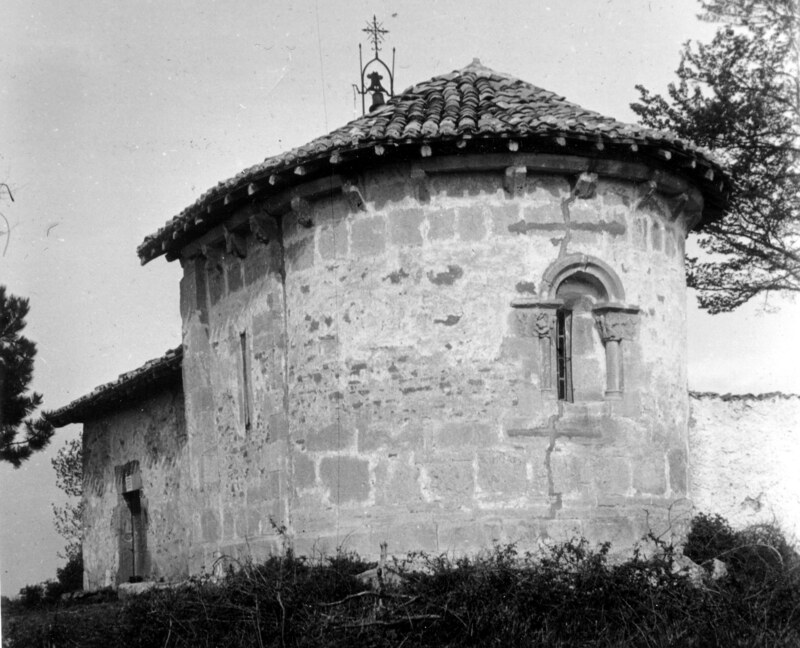 Looking at the photographs taken in the mid-20th century in the hermitage of Saint John of Arrarain, we see that the changes made on the exterior have not been great, except for some repairs on cracks and other ravages caused by time. 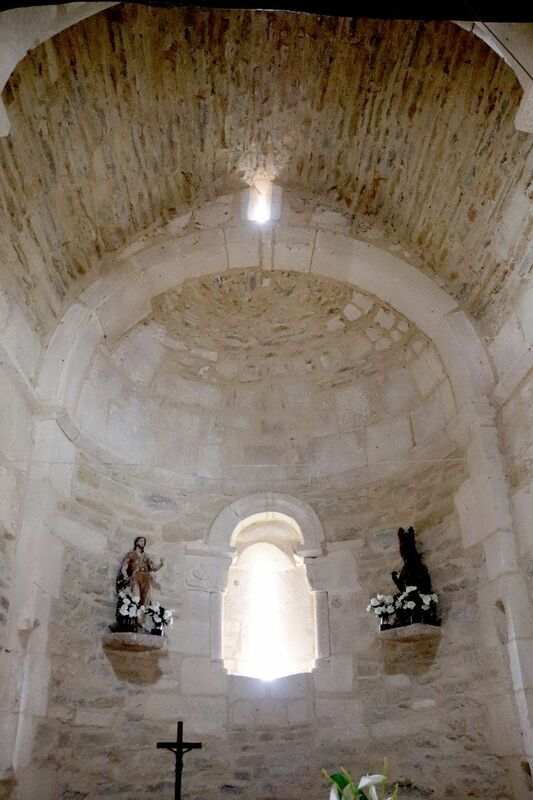 On the contrary, on the interior we can verify that at present the paintings on the apse have disappeared, which, by their appearance, could date from the 19th century. 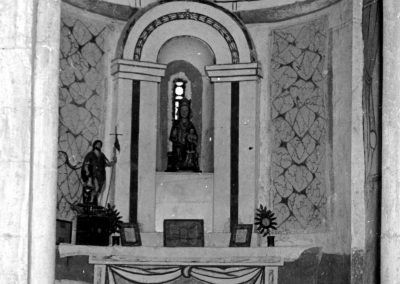 As we can see, the semi-dome of the apse was painted simulating a half-dome, while the walls were covered with traces that recalled the texture of marble. 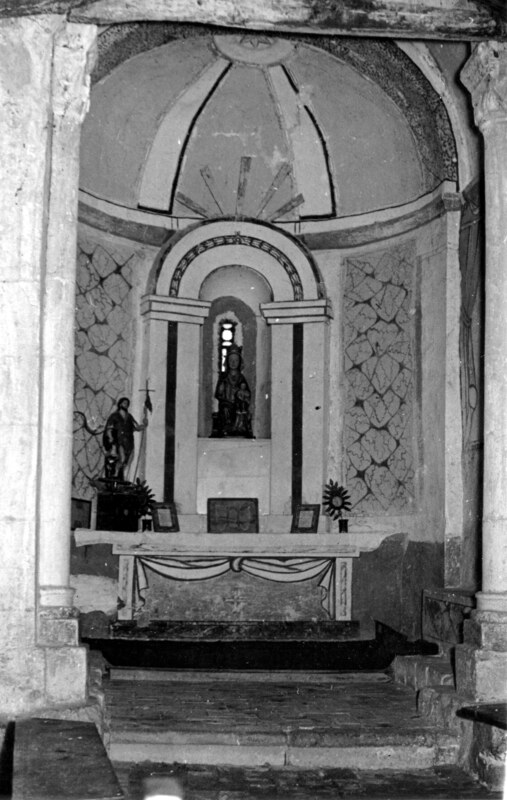 A folded curtain on the front of the altar completed the decoration. 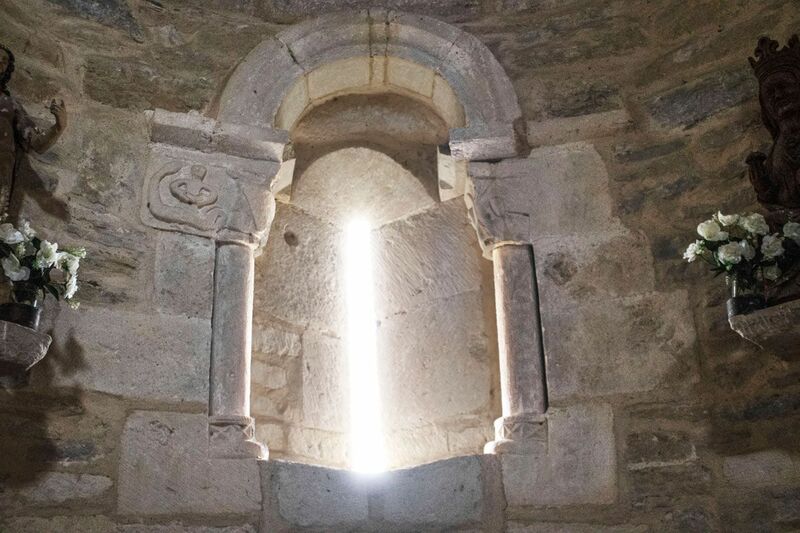 It is also interesting to see how the Romanesque window was converted into a kind of neoclassical altarpiece that accommodated the figure of the medieval Virgin. 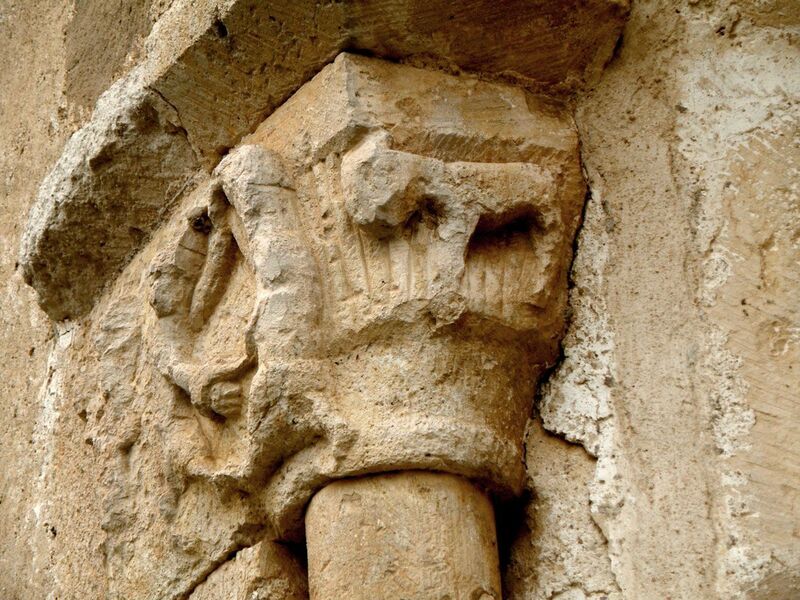 For this reason, the capitals of the apse window were covered with some plaster structures that simulated neoclassical pilasters. 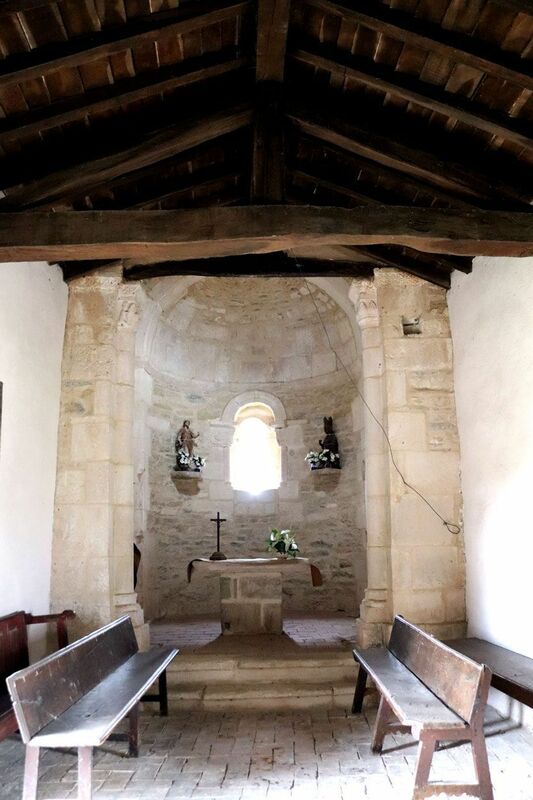 Only the apse has survived from the primitive Romanesque church of the 12th century, while the nave has been replaced by a later body, covered by wooden beams. 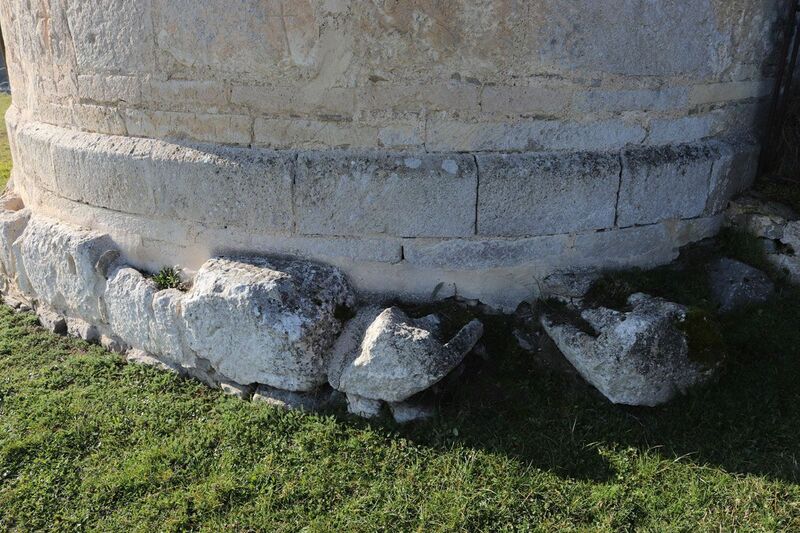 On the apse we find a simple round arch window held by a pair of columns with cable mouldings on the pedestals. 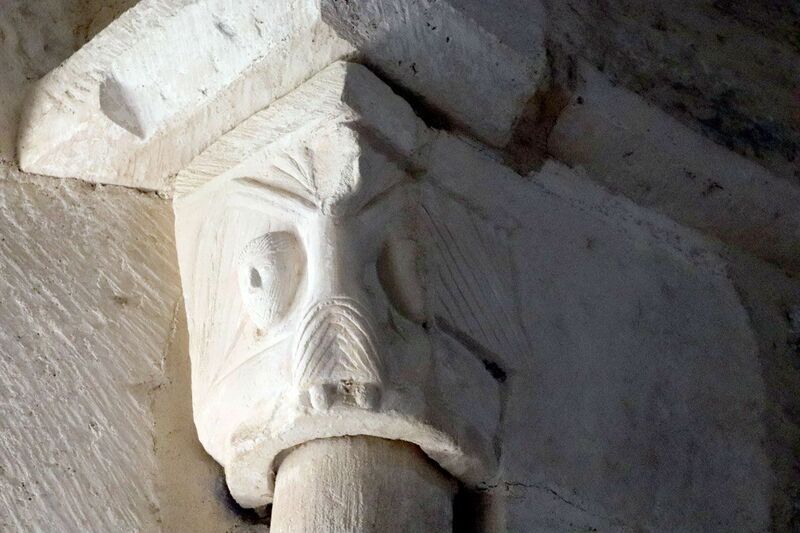 On the capitals, somewhat damaged, complex scenes are described, which are difficult to interpret. 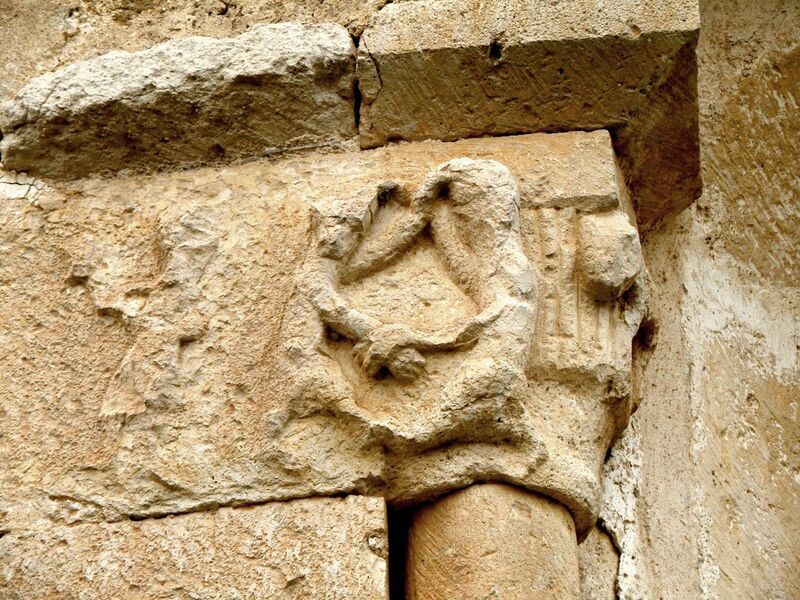 On the left capital, two characters fight each other while next to them the presence of a third one is insinuated, almost erased by the ravages of time. On this same area a four-legged animal can be distinguished, maybe the mount of one of them, which witnesses the fight. 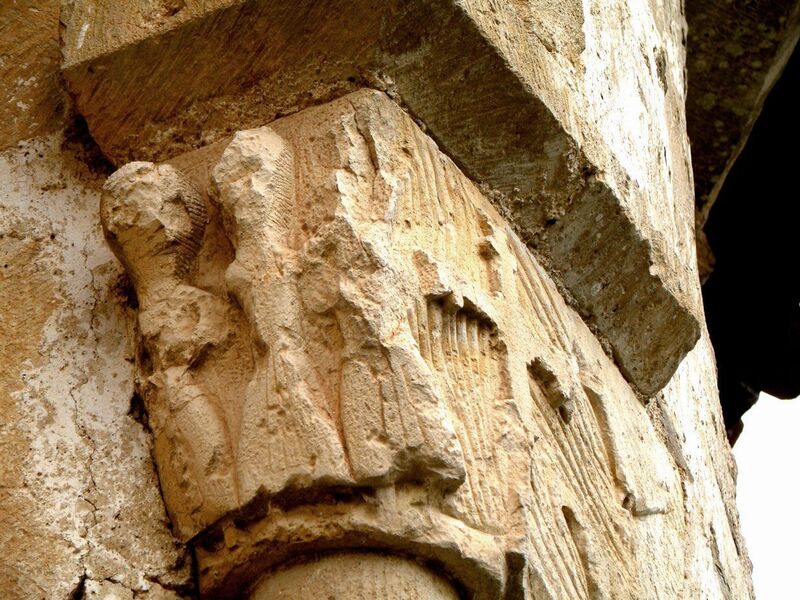 Sometimes, this capital has been identified as the biblical episode in which Jacob wrestles with an angel, although the state of deterioration prevents us to affirm that one of the two fighters has wings. 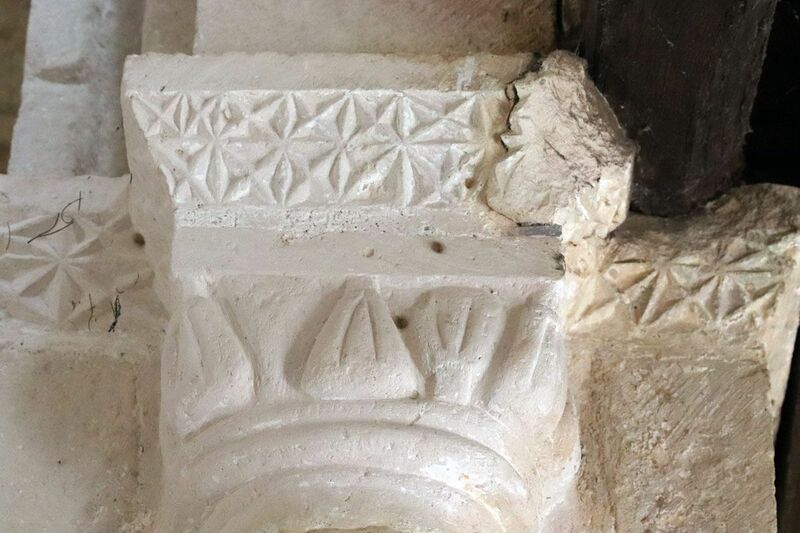 On the right capital, we see a cross whose arms end in fleurs de lis held by a pedestal on a wavy background. 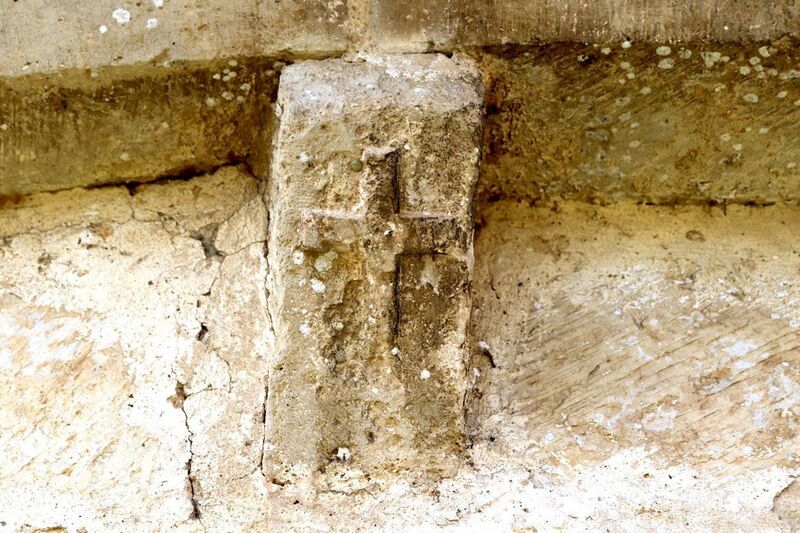 It could refer to a wayside cross, elements that mark a road, the entrance to a town or a crossroads. On one side we contemplate two birds at rest, with their wings folded, and, on the other, three characters with long dresses with knotted waist. 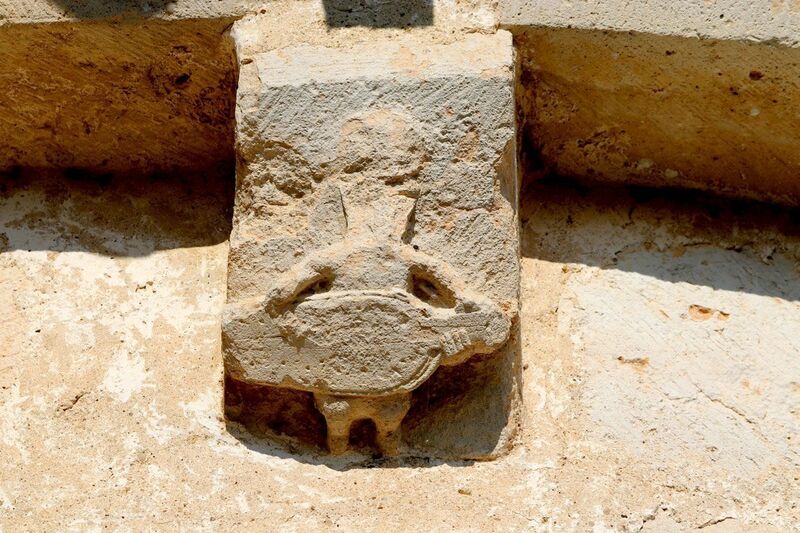 On the cornice of the semicircular apse, some decorated corbels survive, which offer an interesting repertoire. 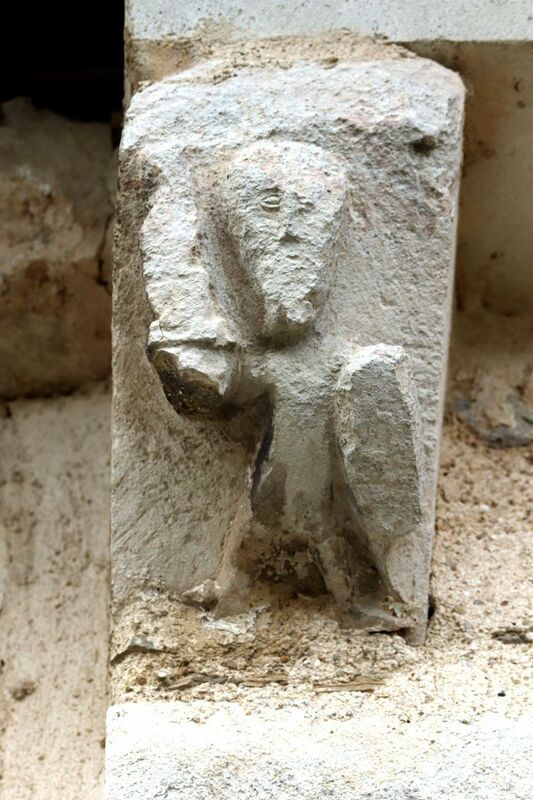 Starting on the south side and following the line to the north, we can see a cylindrical element, possibly a dog or a wolf opening the jaws and showing the front legs, a bearded musician playing a vielle and at his side another corbel that represents a hurdy-gurdy player, musical instruments that were both very common in the Middle Ages. 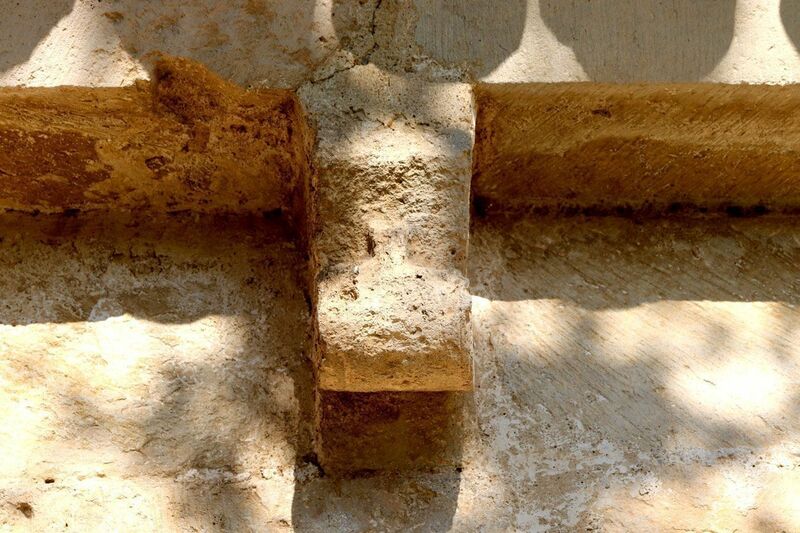 Over the apse window, the corbels do not show any decoration, whereas towards the north side we find one of them with a cross, another one with a checkered motif and one more showing a fluted surface. 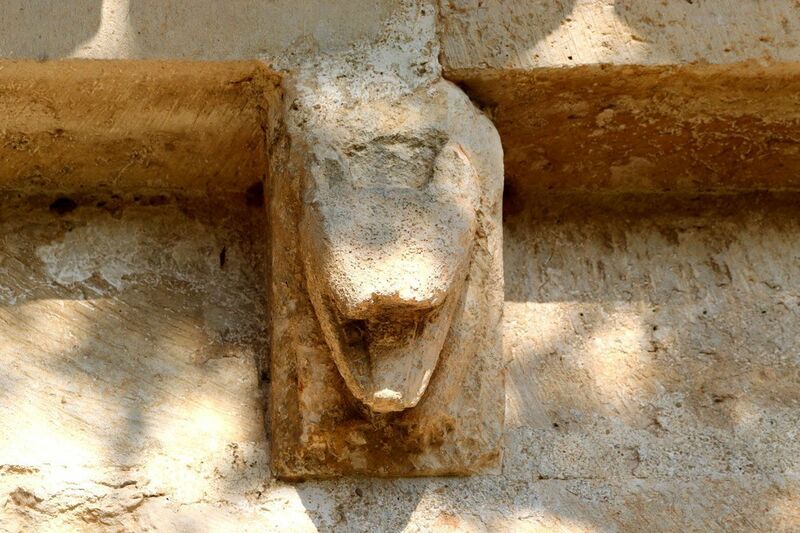 Completing the line of corbels, we perceive a medieval warrior with a raised sword and a long teardrop-shaped shield, a defensive element that became popular among the soldiers contemporary to the building of the temple. 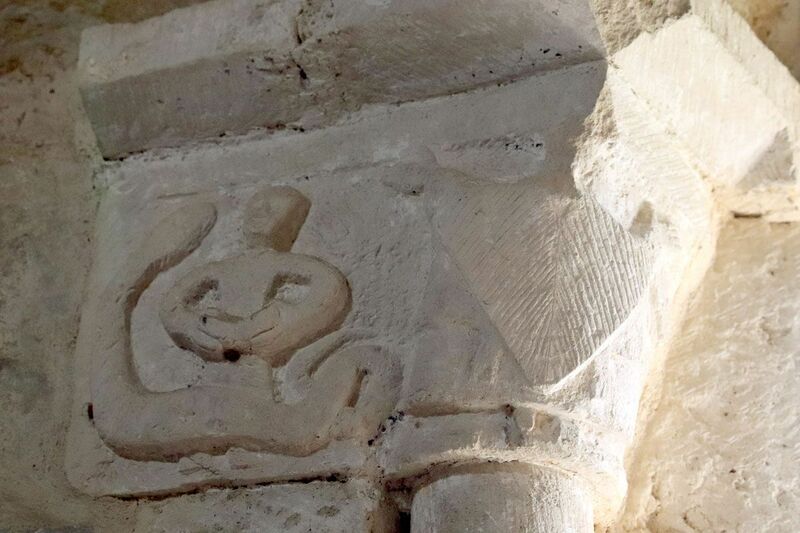 On the interior, we find more scenes and enigmatic motifs on the capitals of the triumphal arch. On the one on the left, an angel with folded skirt protects two individuals that seek shelter under its extended wings. 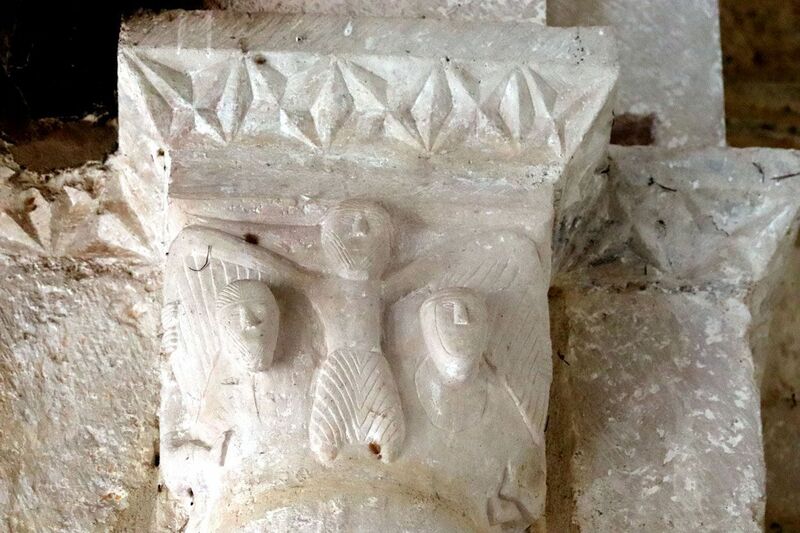 This figure is flanked by other two that, with great effort, pull the angel’s wings to unfold them. The upper cornice shows a geometrical decoration based on repeating crosses, duplicated in two rows on the opposite cornice. 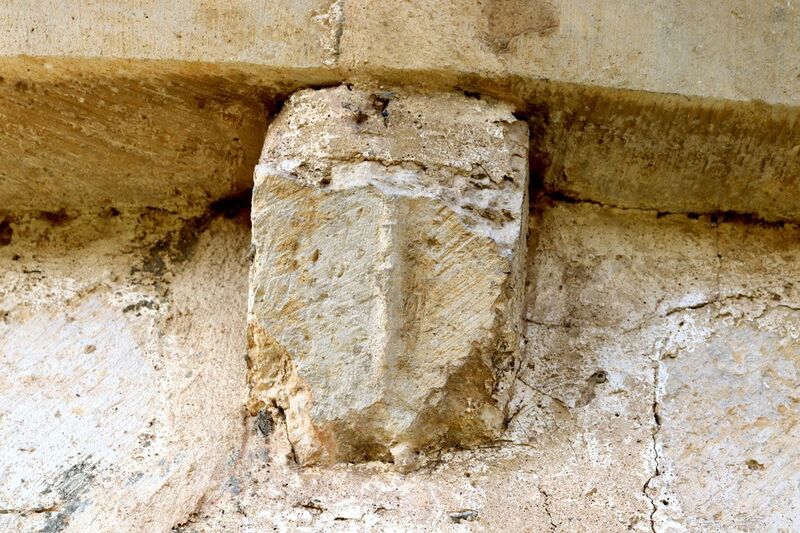 The capital on the right is crossed by triangular elements with certain fleshiness that are marked with incisions. They have been identified with shells, in a possible allusion to the road to Santiago, although it could also be a schematic vegetable decoration. 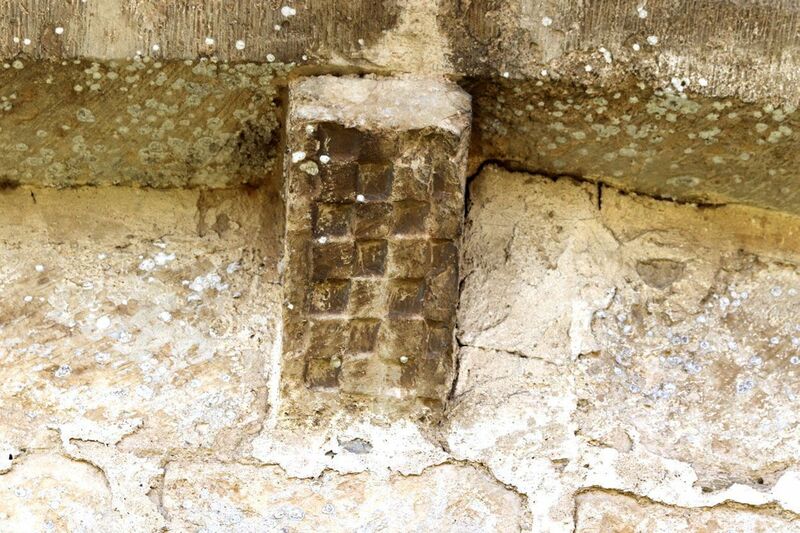 Recent interventions brought to light the capitals of the apse window once again, which had been hidden behind plaster pilasters. 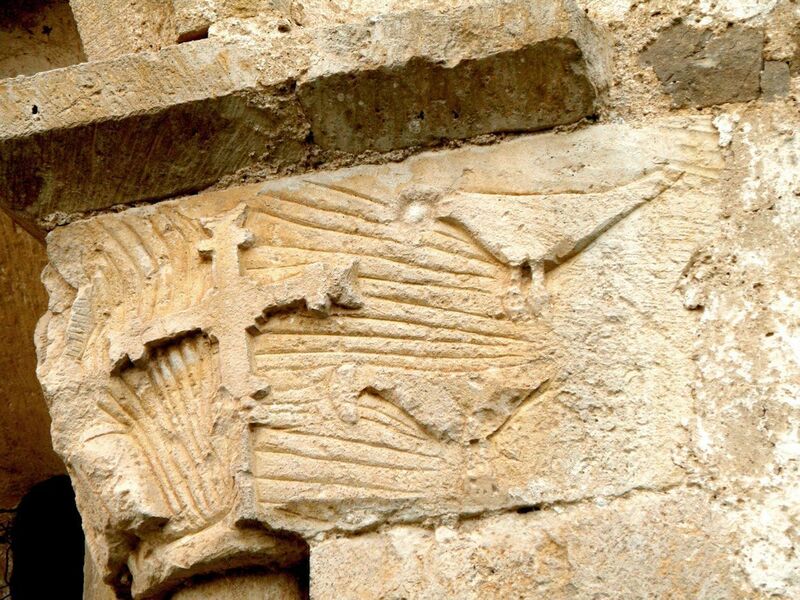 On the one on the right, the theme of the protector angel is repeated, which shelters two human heads under its wings. 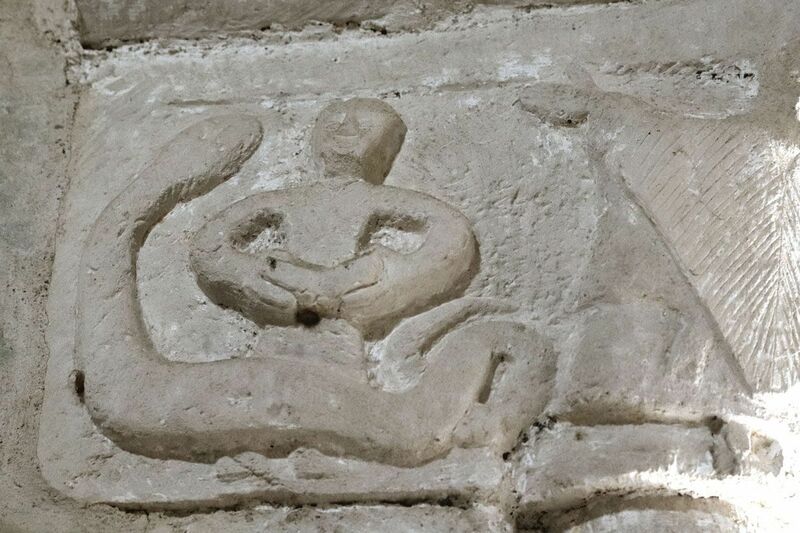 On the one on the left, we can notice a person reading a book, open in his hands, while a snake slides before his feet and raises its head upwards. Next to the reader we find a worshipper, with the arms raised towards the sky, and vestments that identify him as an ecclesiastic. 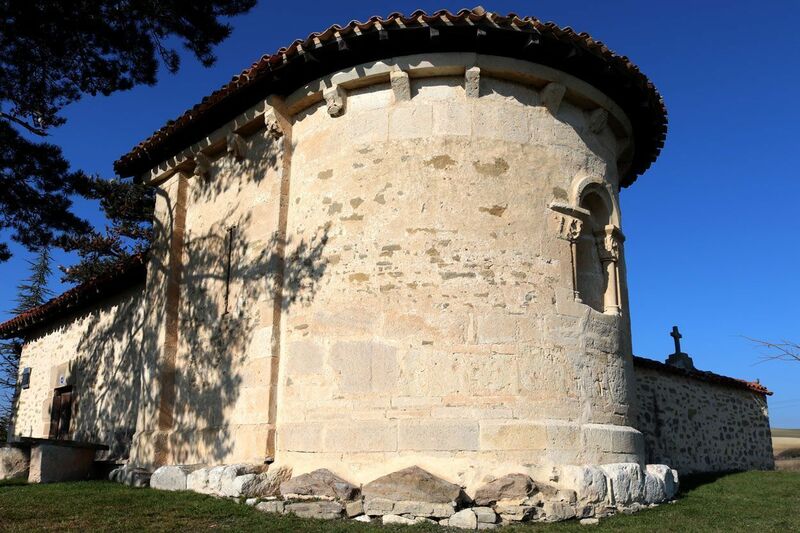 Incidentally, the apse is settled on remains of stone sarcophagi reused for the foundation, which are visible in the lower part that surrounds the apse. It is likely that they are tombs previous to the construction of the building, which belonged to some abandoned cemetery.